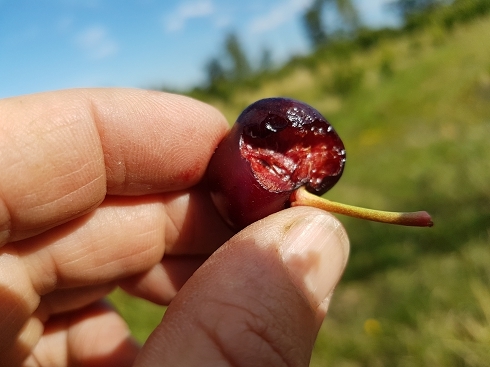 Fruit damage from birds, bats and possums is high on the list of complaints from home fruit growers. This week we look at various netting options,and how they can protect your crop from most of these problems. The birds left us the stems! 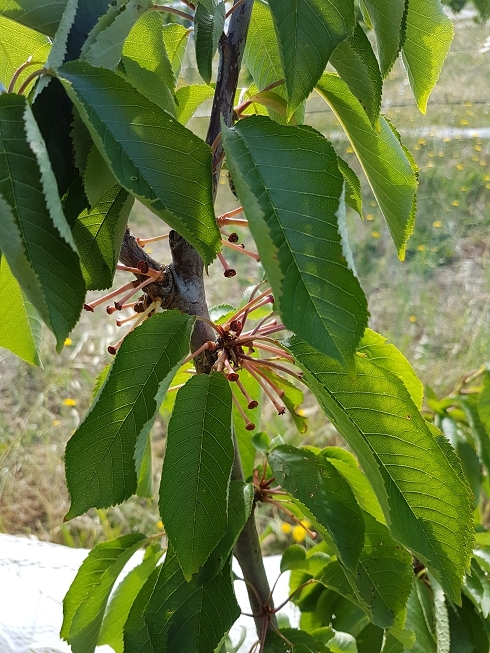 Our new cherry trees are now producing fruit (hooray), and even though we drape netted some of them, it wasn’t completely successful – partly because we were a bit late getting some of the nets on, and partly because the type of birds that were giving us a hard time (parrots) are also particularly clever at getting under drape nets! So, successful netting is not just about doing it in a timely fashion, it’s also about having the right system for your situation. Another big advantage of netting your trees is providing some protection against hail, and if you’ve experienced hail before, you’ll know what we’re talking about! Hail storms are a pretty common occurrence on the farm and we lose at least some fruit to hail most seasons. Birds not only damage the fruit, but can help spread brown rot as well. There are lots of different ways to try to scare birds away, such as CDs hanging in the tree, fake predators and the like, but the only real solution is to net your trees – the sooner we all resign ourselves to this necessity, the happier we’ll all be! This simple net below is made with a frame of star pickets and pipe, and is the easiest and most effective solution we’ve seen (and used). 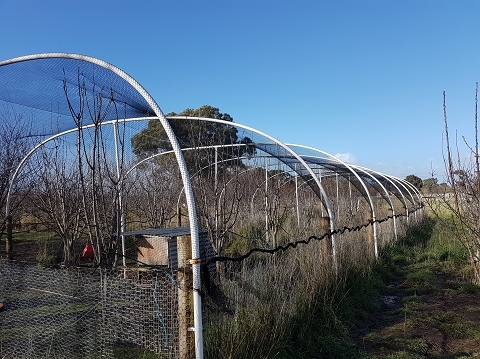 It’s easy to put up (and take down again if you choose), and easy to peg down around the perimeter to stop persistent smaller birds getting in under the net, which can happen with drape netting (as we saw this year!). This particular set up also has wire netting around the base, which can be useful for stopping larger animals from getting into the enclosure. 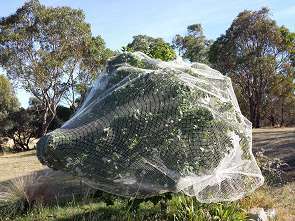 Drape netting is easier if you are doing a lot more trees, and is very effective against big birds, and can also deter fruit bats, both of which descend on the tree from above and don’t like to get in under net. Unless you are really diligent about tying off the net around the trunk, it won’t stop smaller birds like parrots, which are happy to nip under the edges of the net and help themselves. Having said that, it does keep the damage to minimum and is definitely worthwhile. Learn practical strategies that actually work to protect your fruit from birds and other critters in Protect Fruit from Pesky Pests. Hi Sandra, 10M, 15M & 20M wide nets available at some suppliers ( check out on the internet) but you may need to buy 100 metres, quality can also vary a lot. Oh and a tip to remember some types of net shrink in length when stretched down over hoops etc. Bernie. I got a large sized net from peter Land? who is on the Mount Alexander Fruit Fly facebook page…think it would fit over large tree with piping? Slips over very easily as a bit “shiny” and has tie off at bottom. Without wanting to favour one supplier over another, we’ve dealt with Netpro for our farm nets and been happy with the quality and service. Thanks for the recommendation for Peter Land Chris. Next Next post: What are those brown marks on my apples?